Christine Elfman, Torso of Actaeon I, 2016. For Elfman, photographers are like hunters, tracking that which is elusive and ever moving; even more, they are like wayward Actaeon, gazing upon something that is impossible to fully and definitively grasp. 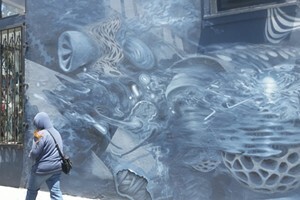 The photographer can only capture a fleeting moment and never in its entirety. To embody this photographic trait, Elfman used juice made from homegrown amaranth to develop several of her works. 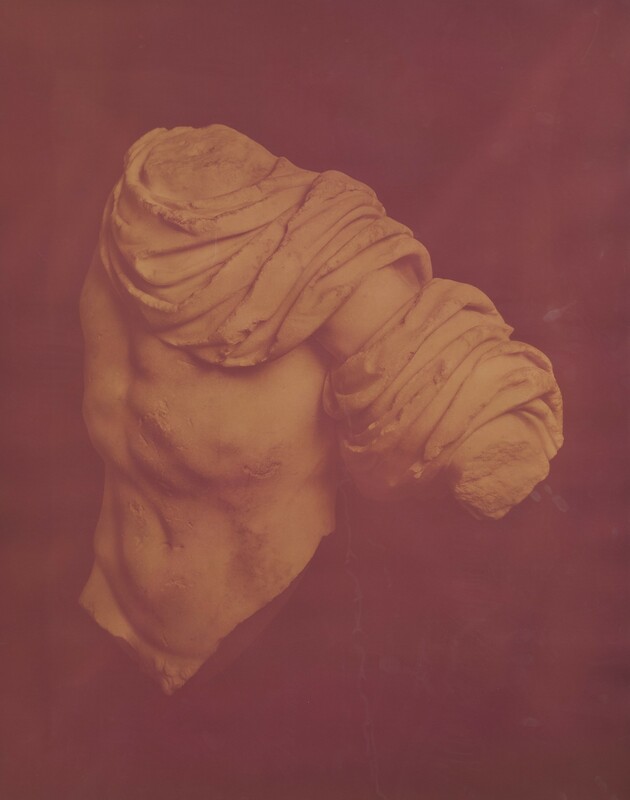 These photographs of sculptures are tinted red and yellow, resembling antique 19th-century photographs. 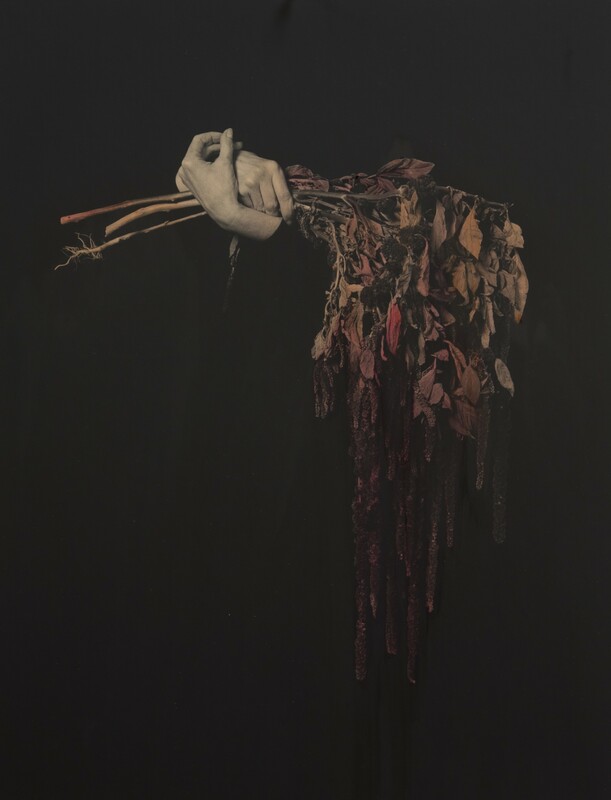 The amaranth, Elfman told me, is fugitive, and these images are continuously deteriorating, more sensitive to sunlight than your average photograph. There is something almost gothic (in the contemporary sense) about these somber images of disembodied torsos and hands and of Actaeon being devoured by his own dogs. In addition to the self-destructing images, "Even Amaranth" includes a number of wonderful and eerie landscape photographs. 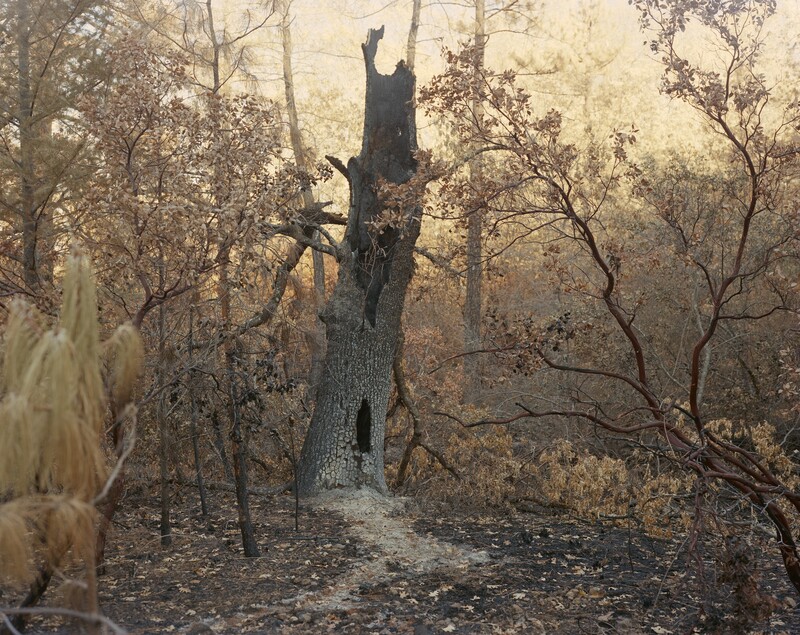 Ash (2016) depicts a small clearing in a wooded area with a hollowed out and charred tree at the center. The details are enrapturing; and the colors of fall and recent fires are melancholic. It is unlikely that Diana would bathe in such a location, but a hunter might stalk its next victim here, and one could imagine this as the site of Actaeon’s death. In fact, Elfman says she chose to shoot locations that felt like crime scenes. These landscapes are accompanied by a number of still-lifes of dried amaranth plants, often clasped by floating sculptural hands. Here, the medium of the amaranth prints becomes the subject, glorified and beautified in a way that would be difficult for a bottle of typical photographic emulsion. This is yet another of the many mirrors which works hold up to the others in the exhibition. "Even Amaranth" is like a house of mirrors, and each photograph influences the others in myriad ways. There are distortions — parables, metaphors, ambiguity — but like the carnival attraction, these distortions give viewers a glimpse of angles that aren’t always visible. Even Amaranth, through September 3, at Gallery Wendi Norris, 161 Jessie, 415-346-7812.